The bride sees tall, wild, tropical bouquets for the tables. We could throw them together in a snap. But that's probably not the way things will work out. Step away from the bucket, Meredith. These are not your garden shears. Pretty! I think I'm going to grab an old 7-up bottle and stick some wild greenery in it for a little center piece - right now! We miss you! Hope you're having a good time. I *think* I'm pickin' up what you're puttin' down. When the time comes for my DDs to get married, I would LOVE to have you come help me put it all together!! They are five and seven so I'm giving you a heads up!! You're the best, enjoy your adventure. Thanks for posting while you're away. Who wouldn't adore a family member like you? Tee hee....yes, it really is wisest to not always jump in...someone please tell my mother in law that!! Does the bride care? If not, go for it. It would be a fun memory of this week spent on the island, and fun for you when you see the pictures and remember your contribution! 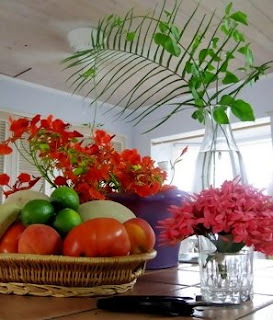 I'd love to see you make beautiful fabulously wild & tropical arrangements! Too bad some people don't know of your skills, including that of being adaptable to what is wanted/needed by those around you. Thanks for the updated post, I'm lurking around all the time missing LMS. I would have thought that the bride would have already had floral arrangements decided at this late date. And what SHE wants, should go. But if she is not having a florist do what she wants and is depending on unknown family talent, then you have no choice but to contribute only if you help is solicited. I would never in a million years leave my flowers to chance at my wedding reception. To me, flowers ae so important,that I would have alloted a good chunk of my budget to make sure they were perfect. It might be awkward to tell family members - or even worse, future family members - that their vision doesn't match yours. That's why God made florists! Meredith, I too struggle with keeping my mouth shut. At my brothers' rehearsal, my dad looked at me and said "This is not your wedding." Ouch. It's hard for those of us who flourish when in charge... I hope you enjoy your time there, can't wait to see more pictures!